Other countries with higher levels of bicycling and walking are often presented as examples when discussing improvements to bicycling and walking in the United States. Countries with much higher levels of bicycling and walking include those in Europe (such as The Netherlands, Sweden, Denmark, Germany, and the United Kingdom (U.K.)), Australia, and even Canada in some major cities. These countries are considered to have the most similarities with the United States, more so than Asian countries or other developing third world countries. Therefore, this chapter will focus mostly on European experiences with some examples from Australia, Canada, and other similar countries. 23.2 Overview of Trends and Issues. 23.3 Pedestrian Facilities and Programs. 23.4 Bicycle Facilities and Programs. 23.6 References and Additional Resources. This lesson has been primarily derived from the FHWA Study Tour for Pedestrian and Bicyclist Safety in England, Germany, and The Netherlands, specifically those sections that describe innovative European approaches to bicycle and pedestrian facility design. (1) Other sources of information are listed at the end of the lesson. A 2003 article in the American Journal of Public Health provides an excellent comparison of bicycling and walking in the United States to European countries. (2) The article highlights the large differences between walking and bicycling levels, as well as the trends and relative safety of walking and bicycling in different countries. The article also highlights some of the causes for these differences, and suggests several strategies that can be adopted from examples in The Netherlands and Germany. The bicycling and walking levels in urban areas in the United States are low compared to many other countries (see figure 23–1). In the United States, only 7 percent of urban travel is made by bicycling or walking. In Canada, that percentage is nearly double at 12 percent. In most European countries, bicycling and walking travel accounts for 25 to 50 percent of all urban travel. Figure 23–1. Bar chart. Walking and bicycling shares of urban travel in North America and Europe, 1995. More compact land use patterns in European cities lead to average trip distances that are only about half as long as in American cities, and thus, trips there are easier to make with a bicycle or by walking than they are here. Higher cost of auto ownership and use (e.g., parking and fuel costs) in Europe means that bicycling and walking trips are often more convenient and less expensive than auto trips. Unsafe, unpleasant, and inconvenient conditions in many American cities play a strong role in the lower numbers of bicycle and pedestrian trips here. Better facilities for bicycling and walking, such as auto–free zones; wide, well–lit sidewalks; pedestrian refuge islands for crossing wide streets; clearly marked and delineated pedestrian crossings; and extensively connected bicycle lane and path networks. Areawide traffic calming of residential neighborhoods, including treatments such as raised intersections and crosswalks, traffic circles, road narrowing, speed humps, and midblock street closures. Urban design oriented to people and not cars, which includes mixed–use development, parking lots that are next to or behind buildings (not in front), fewer cul–de–sacs, and easy access to commercial developments by bicycling or walking. Restrictions on motor vehicle use, including auto–free zones; dedicated rights–of–way for walking and bicycling; lower speed limits for vehicles in cities; restrictions on parking; and restrictions on truck and through–traffic in residential neighborhoods. Traffic education, including more extensive education of motorists, as well as education of school children on safe bicycling and walking practices. Traffic regulations and enforcement, including stricter enforcement of speed limits, red light running, crosswalk laws, and bicyclist regulations. There are clearly several existing cultural and transportation policy differences in the United States that present a challenge to implementing practices from Europe and other countries that have higher levels of bicycling and walking. Several cities in the United States, however, have emulated some European practices. As a result, the levels of bicycling and walking in these cities are much higher than the U.S. national averages. Many of the innovative treatments in these two reports are located in the U.S. but originate from design treatments or concepts borrowed from other countries. The remaining sections of this lesson describe different design elements that are frequently used in bicycle and pedestrian–friendly countries. 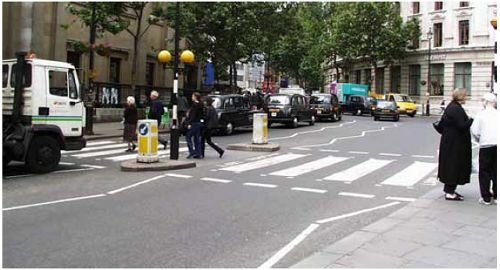 Zebra crossings are pedestrian crosswalks at uncontrolled midblock locations (see figure 23–2 for an example from the United Kingdom). The zebra crossings include high–visibility crosswalk markings across the road along with dashed lines that mark the crosswalk at both edges. 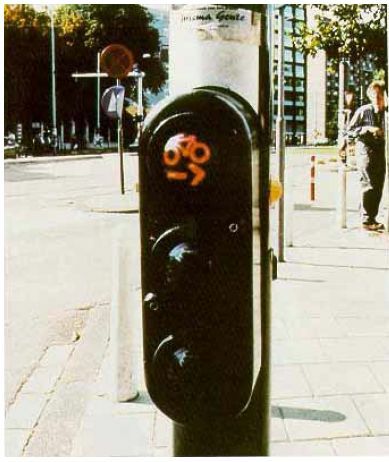 Belisha beacons (i.e., poles with flashing orange–yellow globes—see figure 23–2) are placed on each side of the crosswalk. At zebra crossings, pedestrians have the right–of–way and drivers must yield (i.e., slow or stop) to pedestrians in the crosswalk. Zebra crossings are preceded by zigzag pavement markings next to the curb on the vehicle approach. However, zebra crossings are considered inappropriate on high–volume or high–speed roads where the 85th–percentile speed is greater than 55 km/h (35mi/h). (5) Pelican crossings (see later discussion), which use a pedestrian–activated traffic signal to assign right–of–way, are often used at these high–volume or high–speed locations where zebra crossings are inappropriate. Figure 23–2. Photo. Zebra crossing in London, U.K., with zigzag approach markings and Belisha beacons. A Swedish study found higher pedestrian–vehicle crash rates at zebra crossings than at signalized intersections or unmarked pedestrian crossings. (6) The crash rates were greater at zebra crossings even after adjusting for higher pedestrian demand and higher presence of children and the elderly at the zebra crossings. The authors hypothesized that pedestrians were more careful about crossing the street when no additional crosswalk markings are provided. The crash rate comparisons in the Swedish study agree with a U.S. study of marked and unmarked crosswalks. (7) However, the U.S. study hypothesized that marked crosswalks were only appropriate for certain lower–volume, lower–speed roads. The U.S. study recommended that other treatments (such as median refuge islands, curb extensions, flashing warning lights, traffic calming, etc.) supplement crosswalk markings at high–volume, high–speed crossings. Pelican crossings (most common in the United Kingdom) are midblock pedestrian crossings controlled by traffic signals and pushbutton pedestrian signals. 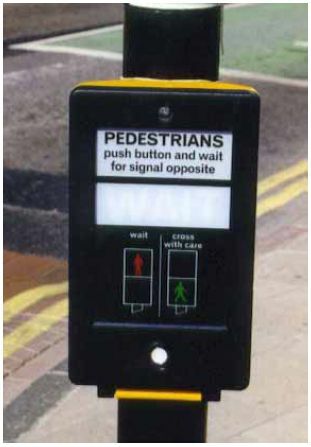 The pedestrian pushbutton hardware lights up and conveys specific messages to pedestrians during each interval, as shown in figure 23–3. A walking green man symbol and a standing red man are displayed (see figure 23–4). A flashing green man indicates the part of the signal phase for pedestrian clearance. A flashing green man on the pedestrian approach concurrent with flashing amber and red balls on the vehicle approach precedes the green ball indication on the vehicle approach. Instead of zebra crosswalks, pelican crossings have dashed (not solid) parallel lines to mark the crosswalk. As with zebra crossings, pelican crossings are not used at intersections, but are installed only at selected midblock locations. Figure 23–3. Photo. Pedestrian pushbutton for pelican signals in the United Kingdom. Figure 23–4. Photo. 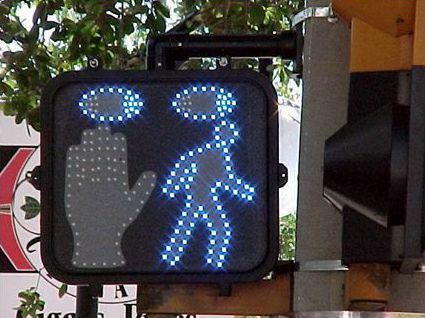 Pedestrian signal with red standing man (shown) and green walking man. 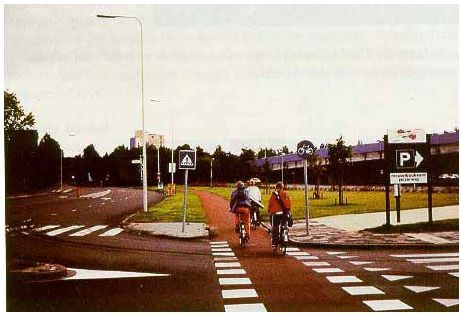 Toucan crossings (see figure 23–5) are shared crossings for pedestrians and bicyclists (i.e., bicyclists "too can" cross together) at selected crossings at the intersection of roadways with pedestrian and bicycle paths. The preferred layout includes a tactile warning surface, audible beepers, or tactile rotating knobs, pushbuttons with WAIT displayed in each corner of the crossing, infrared lamp monitoring, and vehicle detection on all approaches. The desirable crosswalk width is 4 m (12 ft); the minimum acceptable width is 3 m (10 ft). Signal indications include the standing red man, walking green man, and green bicycle. The flashing amber with the red ball indication is not used for the vehicle approach. Crosswalk lines are delineated by white squares. Figure 23–5. Photo. Toucan crossing in the United Kingdom provides separate pedestrian and bicyclist signal indications where trail crosses the road. Puffin (pedestrian user–friendly intersection) crossings in the United Kingdom, generally installed at intersections, consist of traffic and pedestrian signals with red pushbutton devices and infrared or pressure mat detectors. After a pedestrian pushes the button (or stands on the mat), a detector verifies the presence of the pedestrian. This helps eliminate false signal calls associated with children playing with the signal button or people who push the button and then decide not to cross. If a pedestrian is present at the end of a vehicle cycle, the red traffic signal is indicated to motorists, and pedestrians see the green man (i.e., WALK display). A separate motion detector extends the green interval (if needed) to ensure that slower pedestrians have time to cross safely. If a pedestrian pushes the button, but fails to wait for the green man symbol, the detector will sense that no pedestrian is waiting and will not stop motor vehicle traffic needlessly. Puffin crossings are recent developments and are said to improve pedestrian safety and reduce unnecessary vehicle delay. Since the motion detector can detect only those pedestrians walking within the crosswalk lines, physical barriers are used on the curbs to channel pedestrians into the crosswalks. At some crossings, tactile surfaces have been introduced that guide a visually impaired person to the crosswalk. Puffin crossings are currently used at 27 demonstration sites in the United Kingdom. One official stated that they expect to eventually replace all pelican and toucan crossings with puffin crossings if they are found to be effective based on the number of pedestrian crashes, vehicle delays, detector and equipment adequacy, and other factors. Pedestrian messages, such as "LOOK RIGHT" or "LOOK LEFT" (see figure 23–6), are painted on the street next to the curb to remind pedestrians which direction to look for motor vehicle traffic prior to stepping into the street. 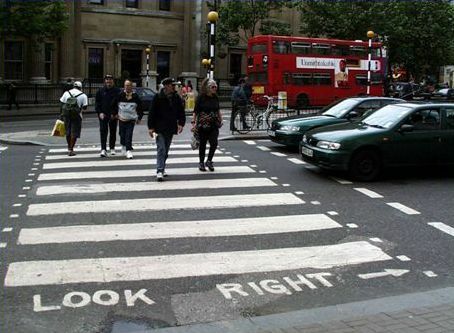 These messages are used extensively in London, U.K., where many tourists are accustomed to looking left for traffic before stepping off the curb and looking right for traffic when standing at a pedestrian island in the middle of a two–way street. These pavement messages have also been tested in the United States at places like Salt Lake City, UT where the 2002 Winter Olympics were held. Figure 23–6. Photo. Pedestrian messages on pavement in London, U.K.
At traffic signals in The Netherlands, pedestrian signal displays include a standing red man (i.e., DON’T WALK) and a walking green man (i.e., WALK). A flashing green man (i.e., you may walk, but the red man display will follow soon) follows the steady green man phase. Pedestrian pushbuttons are also used at some crossing locations. Pedestrian signals are placed at arterial intersections with high volumes of pedestrians and motor vehicles. They are installed near the vehicle traffic signal. Whether the pedestrian signal phase is actuated or pretimed, pedestrians are allowed to choose between crossing with the green indication or crossing during the flashing yellow indication during an appropriate gap in traffic. Since the red indication is replaced by a flashing yellow, the situation allows for 100–percent compliance by pedestrians. Pedestrians no longer cross against the red indication because there is no longer a red indication. At actuated locations, less time is consumed by exclusive pedestrian movements. Since pedestrians know that it is legal to cross whenever they want, they may not bother to call for the pedestrian green. The Dutch also state that the use of flashing yellow indicators enhances the status of the red indication. Red indications will only be used at complex crossing locations. It is unknown whether pedestrians understand that they do not have the right–of–way while they are crossing during the flashing yellow indication. However, it appears that turning traffic must give way to pedestrians; therefore, an exclusive turn arrow cannot be combined with a flashing yellow pedestrian indication. 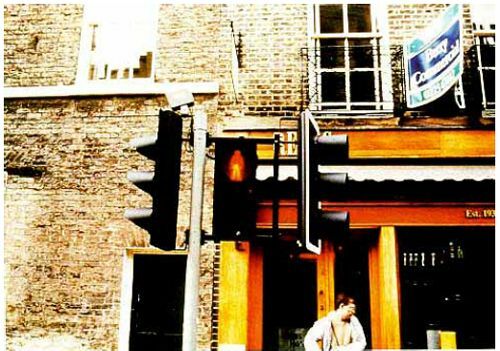 It is safer for pedestrians to cross with the green indication in conflict–free situations. The situation of crossing during a flashing yellow pedestrian indication is still the same as crossing during a red indication. It is difficult to explain it to children and to convince them that they should wait for the green while they see others crossing at times when the light is yellow or red. Many elderly persons feel safer crossing in groups rather than alone. Following the crowd, an older person may end up at the tail end of the group, exposed to oncoming vehicles, and unable to sprint to safety. Another device tested in The Netherlands is called a pedestrian sender. This device provides a means for signal preemption for vulnerable pedestrians, including the visually and mobility impaired. The pedestrian sender is similar to the emergency beepers used by the elderly and impaired to call for help. This device influences the traffic controller by doubling the pedestrian green time, activating an acoustic signal, and preventing conflicting traffic movements. No information about providing a directional indication to the vulnerable pedestrian was available. The results of a questionnaire indicated great enthusiasm for the pedestrian sender. The survey also indicated no misuse of the device. 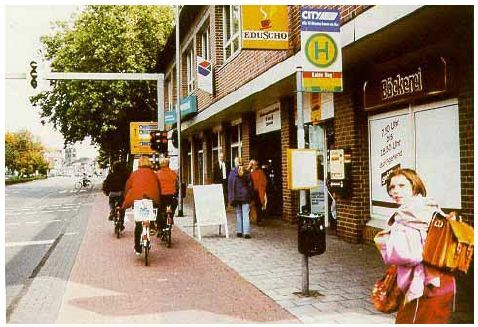 While pedestrian improvements in Delft, The Netherlands, were said to lag behind bicycle facilities, pedestrian signals were installed at selected intersections in that city. A green man, yellow triangle, and red man were used for the WALK, DON’T START (clearance), and DON’T WALK intervals, respectively. Zebra–striped crosswalks are commonly used at pedestrian crossings. Advance stop lines at marked crosswalks to improve pedestrian visibility (while crossing). Countdown displays for pedestrians signals. Pedestrian–activated flashing amber beacons at uncontrolled intersections and midblock locations. Multifaceted community approaches that include engineering, education, encouragement, enforcement, and evaluation. Figure 23–7. Photo. Animated eyes display used in conjunction with pedestrian signal. 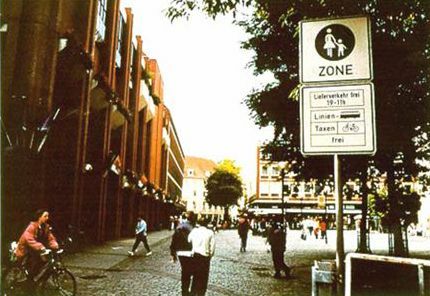 Pedestrian zones have been established on many downtown streets in Germany. These zones can also be used by cyclists during off–peak hours (e.g., evenings). Not only are there fewer conflicts with pedestrians during off–peak hours, but it was claimed that the presence of pedestrian and bicycle traffic helped eliminate crime and added an element of personal safety. The pedestrian mall shown in figure 23–8 allows bus, bike, and taxi travel throughout the day. In Freiburg, on Kaiser Josef, a pedestrian street, cars and bicycles are not permitted. Streetcars and pedestrians have exclusive use of the street. Figure 23–8. Photo. Pedestrian mall in Munster, Germany. 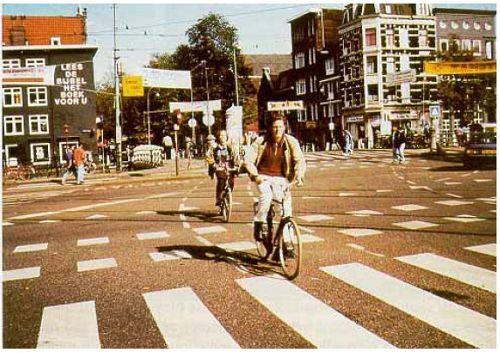 The general philosophy in The Netherlands is to separate bicyclists from motor vehicles whenever speeds increase to greater than 30 km/h (20 mi/h). According to one official, bicycle paths are safer than bike lanes between intersections. At intersections, however, a separate bicycle path will generally have a higher number of crashes. Separate bicycle paths (see figure 23–9) are considered desirable under heavy motor vehicle traffic conditions, but undesirable along streets with low volumes of motor vehicles. 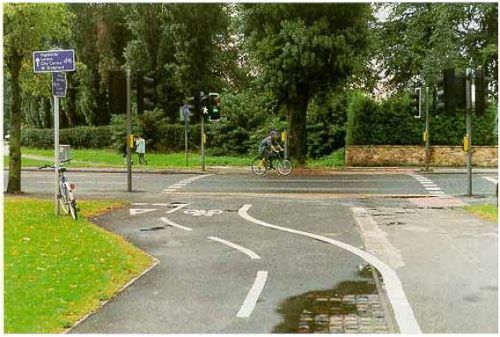 Their general approach to bicycle facilities is to avoid making them too sophisticated. Bike lanes are typically wide enough for two cyclists to ride side–by–side. The bike lanes are generally reddish in color, with visible (and well–maintained) white bicycle symbol markings (see figure 23–10). Bike lanes are typically located between the motor vehicle lane and the sidewalk and are sometimes part of the sidewalk. Sometimes, problems occur with motor vehicles parked on the bicycle lane. Bike lanes are sometimes marked through intersections, as shown in figure 23–11. Figure 23–9. Photo. Bicycle path in The Netherlands parallels the high–speed roadway. Figure 23–10. Typical bicycle lanes in The Netherlands have red pavement color and are wide enough for two bicyclists. Figure 23–11. Photo. Bicycle lane markings carried through an intersection in The Netherlands. In The Netherlands, separate bicycle signals are commonly used at arterial intersections that have bike lanes and high volumes of bicyclists and motor vehicle traffic. The bicyclist signals are vertical red, amber, and green bicycle symbols mounted on a pole, as shown in figure 23–12. They are located either next to the vehicle signal head [i.e., using the same 20–cm (8–in) diameter signal face as the vehicle signal] or at a lower level (1 m or 3 ft high) using a smaller size signal face (7 to 7.5 cm or 3 in). The signal indications are all steady (i.e., no flashing indications), and there is typically an advance green phase for bicyclists, with a simultaneous red phase for right–turning motor vehicles. According to one local official, levels of compliance with the signal are generally not very high. 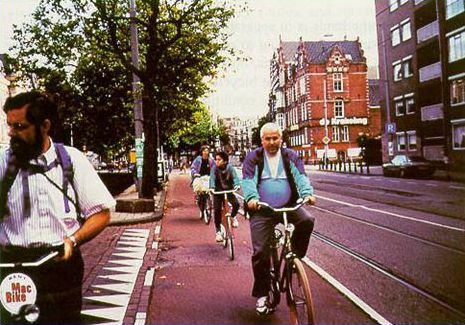 In some cities, such as The Hague and Groningen, a special bicycle phase allows bicyclists in the bike lane to proceed straight before motor vehicles (i.e., right–turning traffic) are allowed to proceed. Motor vehicles are not allowed to turn right on red in The Netherlands, although bicyclists are allowed to do so in certain cities and locations. Bicycle lanes are not typically placed to the right of parked cars, since motorists cannot see bicyclists as easily. It is common for bicycle lanes to end before intersections. Mixing traffic before an intersection promotes anticipation and interaction among road users at the crossing. Otherwise, automobile drivers turning right often are not fully aware of bicyclists and moped riders coming from an adjacent bicycle lane. Renting a one– or three–speed bicycle in The Netherlands is relatively inexpensive, costing approximately the equivalent of $6 U.S. per day or about $30 U.S. per week. Bicycle rental shops are located throughout towns and cities, commonly at train stations. Information on bicycle rentals is provided at local hotels. Figure 23–12. Photo. Bicycle signal used in Amsterdam, The Netherlands. On–street bike lanes are installed on the street level and are typically painted red or installed with a red pavement surface. This type of facility is generally less expensive to install than off–street facilities. Bicycle lanes with continuous lane markings are reserved solely for bicyclists. If the lane is dashed, cars and trucks may use the space only when no bicycle is present. Off–street bike lanes are sometimes installed on the sidewalk level, as shown in figure 23–13. Generally marked with a distinctive red color (which contrasts with the gray stone used for pedestrian walkways and the clear zones between the street and bike path), these lanes provide a greater separation between bicyclist and motor vehicles. When a parking lane exists, this separation allows room to open car doors without obstructing the bike path. 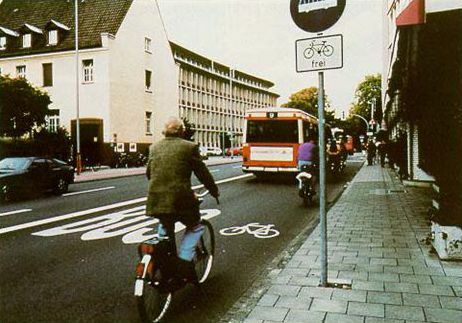 As observed in Munster, bike paths are typically 1.6 m (5.2 ft) wide (one direction on each side of the street), and the separation between cars and the bike path is generally 0.7 m (2.3 ft) wide. Some areas are narrower in cases where sufficient room does not exist. This type of facility was originally promoted in the 1940s as a means to eliminate the hindrance that bikes were causing to cars. They are now retained to separate cars and bicyclists for safety purposes. Bike tracks are generally paths through the countryside and are signed routes. They are generally not paved. Figure 23–13. Photo. Sidewalk–based bicycle path used in Germany. Bus lanes that can also be used by bikes require a width of 4.5 m (15 ft) or more to allow buses to easily and safely overtake cyclists when necessary. As shown in figure 23–14, these facilities are signed and marked with a bus and bike symbol. Figure 23–14. Photo. Sidewalk–based bicycle path used in Germany. Intersection improvements that facilitate bike travel include an advance stop line that allows bicyclists to exit sidewalk paths to turn left in front of motorized traffic. This provides a safer path for left–turning cyclists, provides better visual contact between bikes and cars, and allows bicyclists to be away from vehicle exhaust. This design has been found to be safer than the traditional weave operation. Other signal treatments include special advance green signals for cyclists, and in some cases, signals timed for bicycle traffic (based on a signal progression of approximately 15 km/h or 9 mi/h). It was also observed during site visits that traffic signal heads in Munster had one green bicycle signal head and two red bicycle signal heads. This was done to improve the visibility of the red bicycle signal. Bicycle parking lockers and sheltered spaces are offered at some park–and–ride or park–and–bike lots at transit stations (see figure 23–15). Each bike locker can hold two bikes and provides better security for more expensive bicycles than at bicycle shelters. The rental fee for bike lockers is the equivalent of $11.70 U.S. per month, which is much less expensive than car parking. Figure 23–15. Photo. 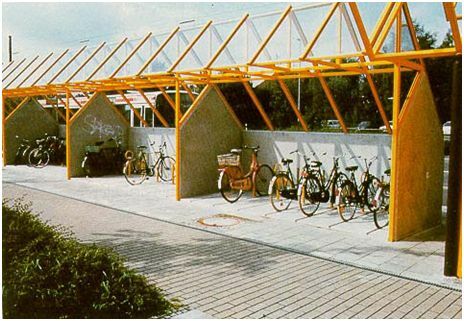 Example of bicycle shelters located at a transit station in Germany. The particular lot shown in figure 23–15 has 108 car parking spaces and is on the outskirts of the built–up area of the city. The construction cost is much less for bike parking facilities than for car parking. Furthermore, about 10 to 12 bikes can be parked in a single car–parking space. Bike parking at the train station facilitates train–bike combination trips. Bikes are parked in monitored areas and can be parked for four days before being moved to a long–term parking area. This allows train commuters to leave their bikes at the train station over the weekend. The City of Munster is also planning a 4,000–space underground bicycle parking facility at the train station. Separate signal heads for bicyclists, as well as separate distinctive signal heads for trolleys, are used where exclusive bus lanes exist (using vertical or horizontal white lines as bus signal displays). This often results in three sets of signal heads side–by–side (car, trolley, and bike). Installing bike racks at corners also helps intersection visibility. The study team was shown an intersection where car parking at the intersection had previously created a visibility problem for motorists on the side street. The problem occurred even after NO PARKING signs were posted. Installing bike racks at the corner physically prevented car parking and opened up sight distances for side–street traffic. A variety of bicycle fatalities occur in the United Kingdom, particularly in smaller cities such as York and Cambridge, U.K., which have extensive networks of bicycle lanes and paths. Bicycle lanes are commonly narrow; some were observed by the study team to be 1 m (3 ft) wide or less in many cases. Along some city streets, contraflow bike lanes exist; that is, one–way bicycle lanes move in the opposite direction to one–way motor vehicle traffic (see figure 23–16). Double yellow lines next to the curb mean no parking. Figure 23–16. Photo. 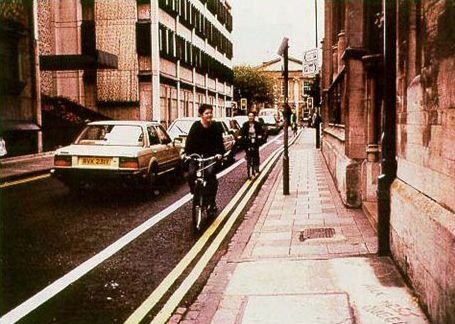 Narrow contraflow bicycle lane in Cambridge, U.K. 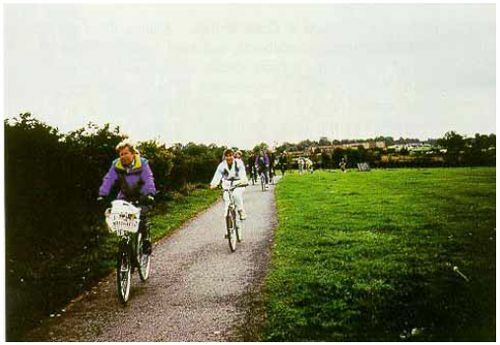 In some areas of the United Kingdom, bicycle trails allow for long–distance cycling separate from motor vehicles (see figure 23–17). Entrances onto these trails are designed to prevent most types of motor vehicles (including motorcycles) from entering (see figure 23–18). Such barriers cause some problems for bicyclists who enter or exit the trail. Bicyclists are also allowed to use an extensive network of exclusive bus lanes throughout London. In York, an abandoned rail line became an excellent bicycle facility by using existing bridges and underpasses. A 1,600–km (1,000–mi) cycle route network for London is planned over the next several years. Figure 23–17. Photo. Bicycle trail on an abandoned railroad right–of–way south of York, U.K. Figure 23–18. Photo. 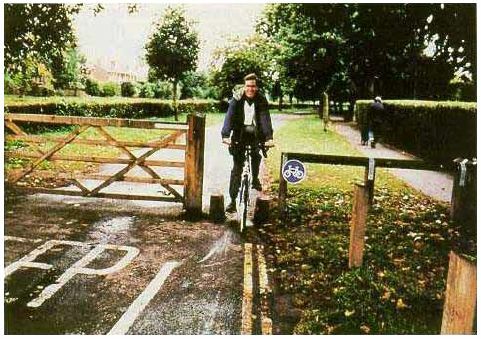 The entrance to this bicycle trail is designed to restrict entry to motor vehicles. Compare and contrast local U.S. and European bike and pedestrian facilities as well as lifestyles. Would the European facilities make sense in the United States? Would they be used? Zegeer, C.V., M. Cynecki, J. Fegan, B. Gilleran, P. Lagerwey, C. Tan, and B. Works, FHWA Study Tour for Pedestrian and Bicyclist Safety in England, Germany, and The Netherlands, Publication No. FHWA–PL–95–006, FHWA, October 1994, available online at http://ntl.bts.gov/DOCS/bikeped.html. Pucher, J., and L. Dijkstra, "Promoting Safe Walking and Cycling to Improve Public Health: Lessons From the Netherlands and Germany," American Journal of Public Health 1509–1516, vol. 93, no. 9, September 2003, available online at http://www.ajph.org/cgi/content/abstract/93/9/1509, accessed May 3, 2004. Lalani, N., Alternative Treatments for At–Grade Pedestrian Crossings, Report No. LP–629, ITE, 2001. Nabti, J., and M. Ridgway, Innovative Bicycle Treatments: An Informational Report, Publication No. IR–114, ITE, 2002. Davies, D.G., Research, Development, and Implementation of Pedestrian Safety Facilities in the United Kingdom, Publication No. FHWA–RD–99 –089, FHWA, December 1999, available online at https://www.fhwa.dot.gov/tfhrc/safety/pubs/99089/intro.htm. Ekman, L., and C. Hyden, Pedestrian Safety in Sweden, Publication No. FHWA–RD–99–091, FHWA, December 1999, available online at https://www.fhwa.dot.gov/tfhrc/safety/pubs/99091/99091.pdf. Zegeer, C.V., J.R. Stewart, H.H. Huang, and P.A. Lagerwey, Safety Effects of Marked vs. Unmarked Crosswalks at Uncontrolled Locations: Executive Summary and Recommended Guidelines, Publication No. FHWA–RD–01–075, FHWA, March 2002, available online at http://www.walkinginfo.org/pdf/r& d/crosswalk_021302.pdf. Van Houten, R., and J.E.L. Malenfant, Canadian Research on Pedestrian Safety, Publication No. FHWA–RD–99–090, FHWA, December 1999, available online at https://www.fhwa.dot.gov/tfhrc/safety/pubs/99090/intro.htm. Hummel, T., Dutch Pedestrian Safety Research Review, Publication No. FHWA–RD–99–092, FHWA, December 1999, available online at https://www.fhwa.dot.gov/tfhrc/safety/pubs/99092/intro.htm. Cairney, P., Pedestrian Safety in Australia, Publication No. FHWA–RD–99–093, FHWA, December 1999, available online at https://www.fhwa.dot.gov/tfhrc/safety/pubs/99093/intro.htm.